For the final product, I was able to create a prototype for the particular inflatable ladle I wanted to create, but not the envisioned model. But that’s okay, because we are all learning. 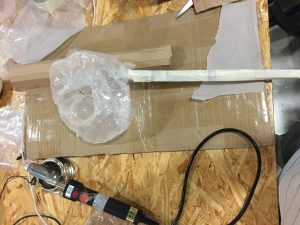 I wanted to create an inflatable ladle to find a practical solution to a small, but annoying problem of 3-dimensional shaped ladles that would awkwardly fit in camping backpacks. I go camping in California often and this is a reoccurring problem. I wanted to create an inflatable ladle that goes from an easily packageable 2-dimensional object to 3D, and then back to 2D when not in use. My original idea’s main problem (also input from the other students) was the heat factor in building my ladle. Most materials used for inflatables, such as PVC, are not durable under heat and in fact, become poisonous for consumption when heat is applied. I researched and found that certain inflatable jacuzzies were able to withstand heat, but it is not enough to withstand boiling temperatures, which would be relevant. Soups and stews made on camping trips are piping hot. Though I wanted to create a silicone model inflatable, because silicone is able to resist heat, major problems arose. 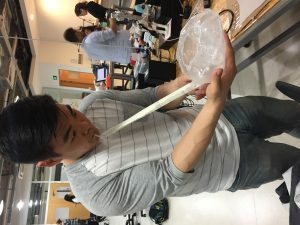 There was not enough time and expertise to create a silicone model for ladle purpose scooping and inflatable components. I abandoned that idea and simply used a plastic sheet to create a prototype. My third attempt was successful. Here are the needed materials. 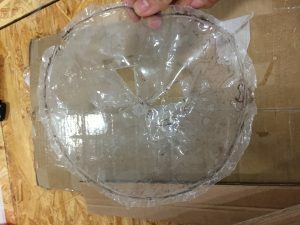 I cut out a hollow middle circle on the top circular sheet. I then attached, with the heating iron, an additional cylinder-shaped portion that connects the top circle with the middle of the bottom circle. This was the most time consuming and difficult part. When inflated, the plastic sheets would finally create a ladle shape and have some area to scoop liquids in. A small tube rope was inserted and I wrapped a long piece of cardboard paper to create a long handle. So, one could blow through the small hole at the bottom of the handle to inflate the ladle. I then wrapped the cardboard paper with camouflage paper in spirit of the camping/outside atmosphere. The most challenging aspect of this project was definitely the heat-sealing. The heat iron, because of its large and curvy iron shape, does not accurately heat seal the desired area. So, it would heat too far or too close, or simply burn through the cut-out plastic. I started over several times because of the heat sealing. To attach the supplementary parts in the middle hole area of the ladle was very frustrating. The baking paper always had to be over and under the plastic. If I had to do this project again, because it is a prototype, I would simply use tape to seal the edges. I would also cut the plastic sheets further to create a bigger bowl shape in the middle of the ladle. In terms of aesthetics and the final product, I am proud of the outcome. The ladle inflates the way I want it to and is able to scoop up materials or liquid. 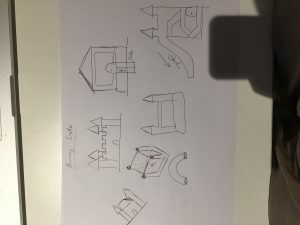 The overall goal of the project was achieved: an object that goes from 2D to 3D and back to 2D. Thank you Professor Mikesell for the semester and showing me the cool concept of inflatables, applicable in many areas of life. Longer term Assignment: Read one of the following texts. Some longer texts you can pick a chapter from. Compose a thorough post summarizing the reading and be prepared to give a short presentation on the reading. The book I read for this assignment was the Ghost Army of World War II by Rick Beyer. He is an author and documentary filmmaker, specializing in history. His other notable works are included on the History Channel, National Geographic, and the Smithsonian Institute. The book contains many anecdotes, personal letters, and firsthand accounts of the D-Day invasion on June 6, 1944, up to the final push to the Rhine River at the German border. The vividness of each account was able to convey the scale and success of each ghost army mission. 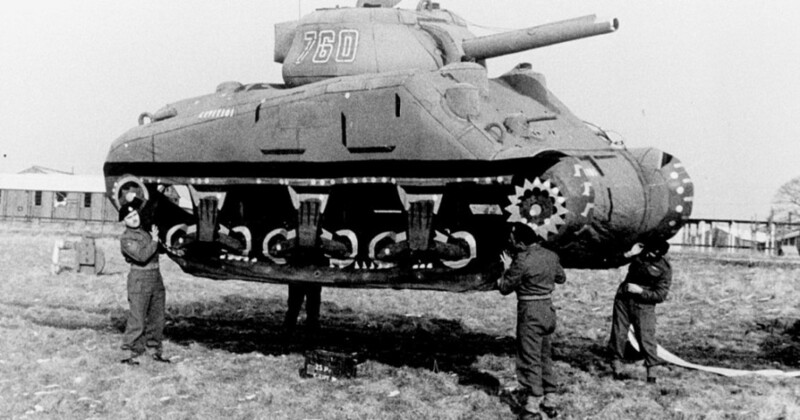 Essentially, the ghost army in the title refers to the 23rd Headquarters Special Troops, composed of around 1,100 men. They were part of Operation Quicksilver, and this operation was designated to use inflatables, camouflage, and deceptive art to manipulate and misdirect the enemy. The 1,100 men were recruited from art schools, advertising agencies, and creative thinking agencies, mostly from New York and Philadelphia. Members who became famous after the war include Bill Blass, Ellsworth Kelly, and Arthur Singer. They conducted twenty operations from the Normandy invasion to the Rhine River breach. Four levels of deception were used. The first was the visual deception by the 603rd Camouflage Engineers. 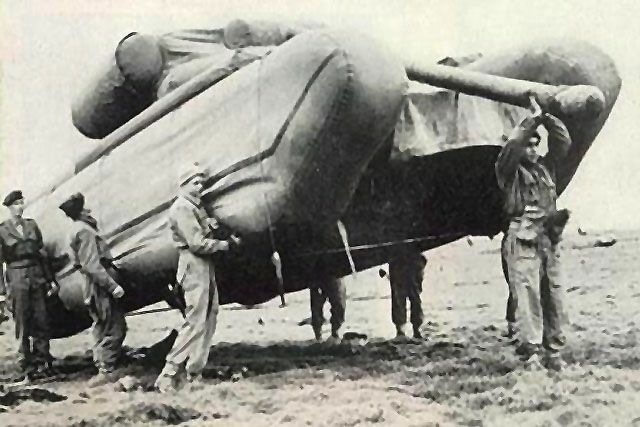 They used fake inflatable tanks, artillery, planes, military tents, and jeeps to fool reconnaissance planes from above and enemy scouts on the ground. 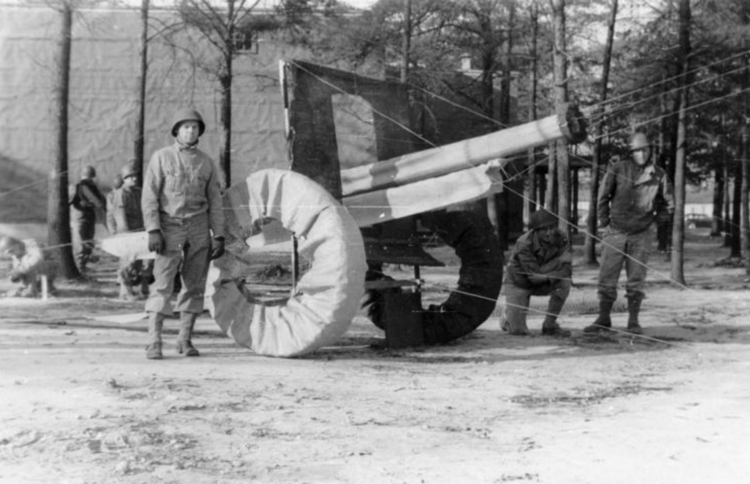 The engineers purposefully used imperfect camouflage to have the campsites detected by the enemy planes. Inflatable M4 Tanks, P51D Mustangs, and B17 bombers are included in the book and they look very convincing. The second level was sonic deception. Recorded sounds from Fort Knox, ranging from artillery firings to officer conversations, were implanted on powerful speakers. The roaring engines would be heard up to fifteen miles away. The third level was radio deception. Spoof radio units were setup and they tried to give the impression of a large military presence in loosely guarded areas. The fourth level was atmosphere. Drivers in trucks were ordered to be drive in looping convoys with only two soldiers in the back (beneath the tent covering) to give the impression that the truck was filled with infantry. Soldiers were also ordered to go to the bustling towns’ cafes and openly talk about the fake ghost army. I have previously seen on the History Channel about this ghost army when I was young. Reading the actual book and individual narratives were very enlightening. The assignment was enjoyable because history is one of my favourite subjects. The recreated planes and tanks were perfectly done to resemble the actual models. It is indeed unexpecting to see such a gimmicky and often ignored topic of inflatables to be used in the most destructive and impactful war of human history. There are so many inflatable objects and products online. Find the most interesting or weird inflatable thing online and explain it in a blog post and be prepared to share your results in class. 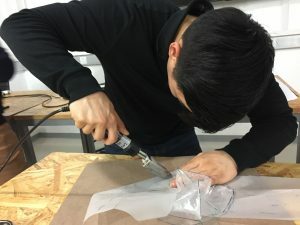 The most interesting inflatable project I found online is a concept called “auto-inflatables” being developed by the media lab at MIT. Auto-inflatables are self-inflating objects that are a result of a chemical reaction involving carbon dioxide. This means that there is no need for external hardware, force, or device for actuation – these auto-inflatables simply actuate on their own. The particular transformations involved include shape, volume, texture, temperature, colour, and movement. These changes mean a lot for supply distribution in assembly lines, transportation, emergency response, and architecture. The concept of auto-inflatables removes the necessity of labour and additional costs of packaging. They can be used for personal use as well. Two images from the article were some form of teeth support and neck pillow. Currently, the most problematic feature of inflatables is the air source. Requiring a giant fan or a small pump makes it inconvenient to use inflatables on a daily and practical basis. 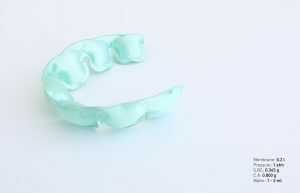 Removing this obstacle opens up a lot of not only business opportunities (lowered costs), but also supporting systems for the human body. I think the work done by the MIT labs, specifically in soft robotics, is very forward thinking. They are able to take a simple concept and stretch it to fulfil and complete complex tasks in a more efficient manner. Reading: Check out these links, some are technical and at least one is not. Explain in a blog posting how one might relate to your final project idea or one you find interesting in another way. The article that intrigued me the most and is most relatable to my final project is the one with experiments in textile pneumatics. The writer says the main problem with pneumatics is the cost of the parts. I plan to use silicone, perhaps Dragon skin, to make my final project and it is very expensive. 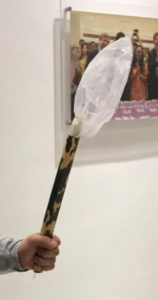 I am also inspired to use a glue film to help secure the filler tube and have the inflatable bend the way I want to create a scooping/half-cylinder shape. Through trial and error, the writer realizes stretchy lycra knit and a very mobile woven nylon are inadequate materials because the pump is not able to get them up to pressure. I will be using human air lungs in my final project. To make the assemblies airtight, I would need an air proof fabric to back up the glue film. On a separate note, I found the inflatable mattress idea very impressive. 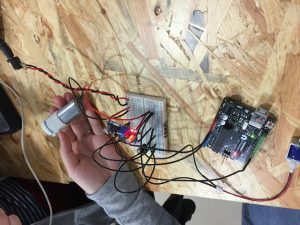 It uses Arduino time sensors to provide motion to the mattress to alleviate back and neck pain. He created all the valves and coding himself which is very impressive. For this lab, we were instructed to build a system that cycles through state changes, specifically from deflation to inflation. 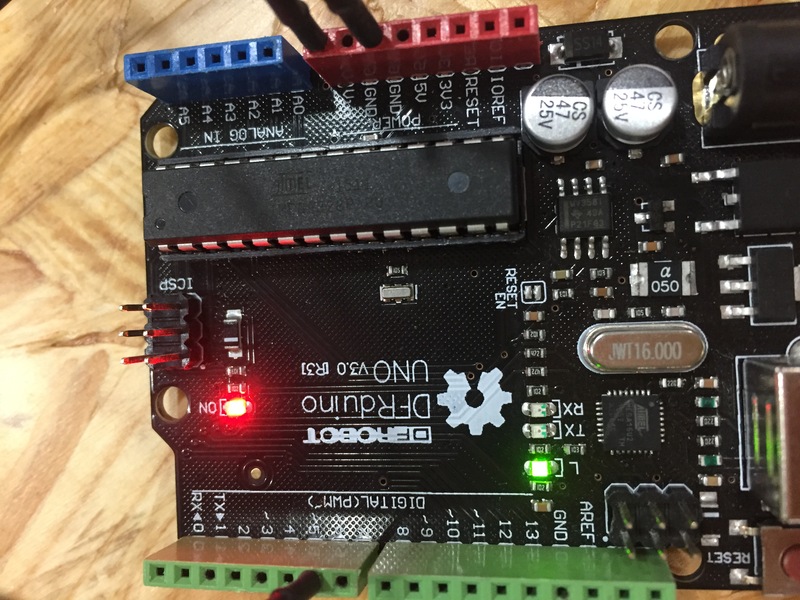 This is made possible by controlling and measuring air pressures with Arduino. 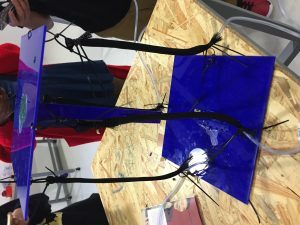 I was responsible for acquiring the code for inflation/deflation while Maya and Marina attached the arduino with cables and the air pump. 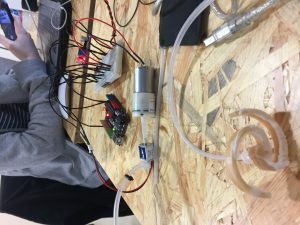 The total materials used were a voltage converter, air pump, valve, diode, Arduino, some jumper cables, AC adapter, and a breadboard. Maya also used the soldering iron to attach jump the jumper wires to the pump. 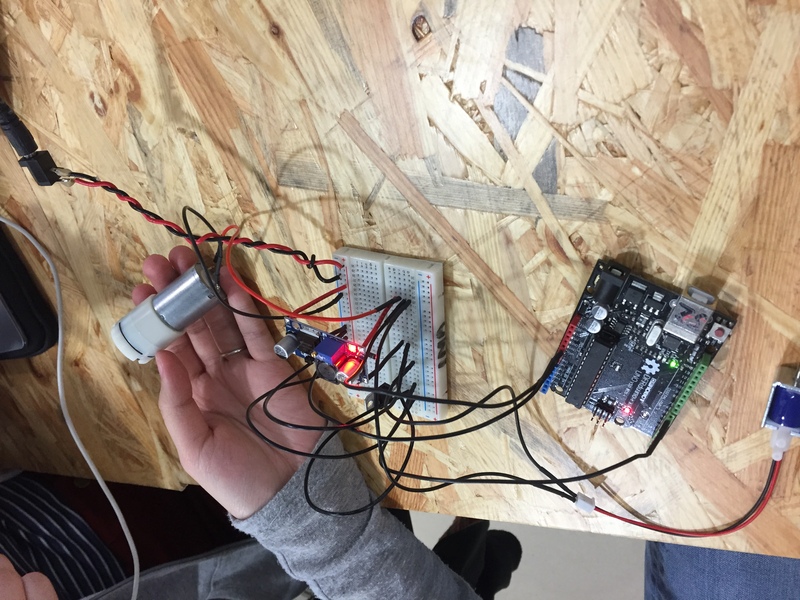 Maya and Marina configured the converter to get it down to six volts. 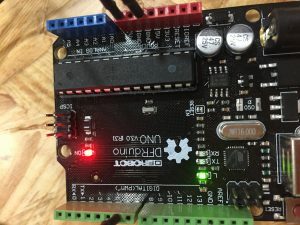 The code was first wrong so the clicking timer sound was not heard. Professor Mikesell tried to inflate the balloon with his lungs but it did not work so we used a syringe to hand pump the air. Next, we got rid of the airbag style pouch and inflated the swirly material shown below. It would spread out when inflated and curl back into a swirl when deflated. For this lab, we tried to recreate a miniature dome using the dome cover calculator. We were divided into a group of three and compiled materials of PVC sheets, scissors, black markers, a ruler, and a heat iron to seal the PVC sheets together. We decided on using eight separate gores to assemble our small dome. We used the gore calculator from domerama.com and measured/marked the dimensions on a thick cardboard piece of paper. 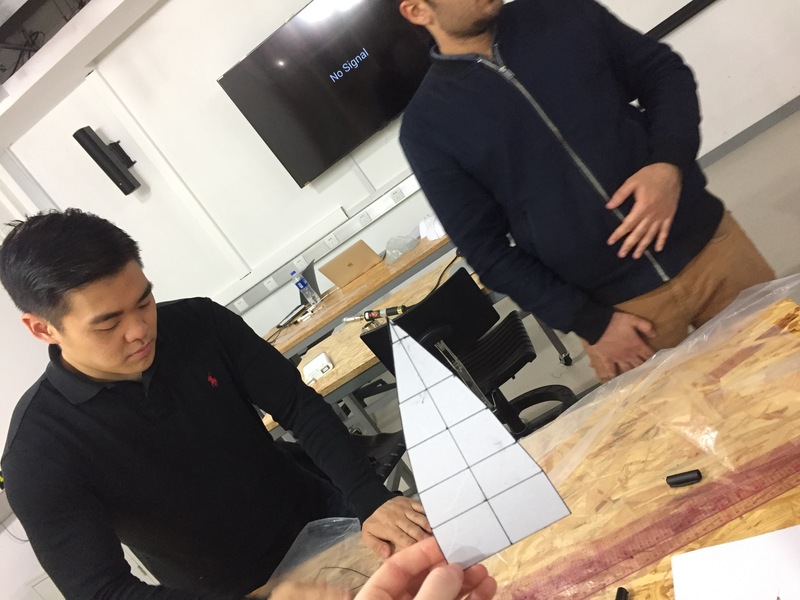 We had to do this process twice because we miscalculated the gore dimensions onto the cardboard and created a more triangular shape that was inadequate to build a dome. Next, we aligned the PVC sheet on the cardboard and cut out eight pieces. 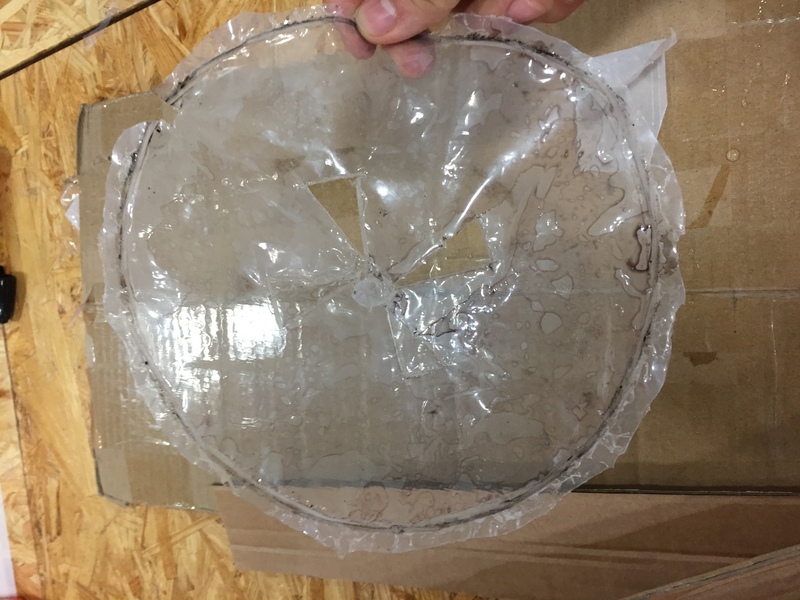 We tried to cut more than the marked lines because the heat sealing would require some space. 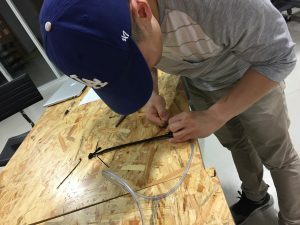 The specific challenges presented in this lab were that it was incredibly difficult to get an accurately linear seal on the PVC sheets because the heating iron is curvy (the heated part). So some parts were too thinly sealed, while other parts were sealed inside the designated lines. This would eventually create an unevenly shaped dome that has some gores loosely falling apart from each other. After we had eight individual gores, we heat sealed in pairs of two and then combined four pairs to create one giant, whole piece. 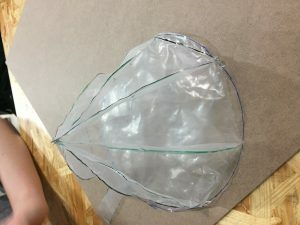 We attached a blowing piece to the circular bottom flat plane and tried to inflate the balloon. But, the dome had many soft holes between the gores because they were improperly heat sealed. This lab was very meticulous and requires very precise measurements/heat sealing to create a successful dome. This week’s readings presented creative consumer products that utilize the concept of inflatables. I thought the Hovding bicycle helmet is the most impactful and high-potential item out of the three. It fulfills both categories of practicality and aesthetics. The problem with standard bicycle helmets is that they are too bulky and do not look nice. In fact, I rarely see bicyclists in my hometown in Orange County or here in Shanghai wearing sturdy bicycle helmets. This Hovding helmet looks stylish and fits compactly on the neck area. It is also a light and soft inflatable material, rather than the solid ones used in traditional helmets. In terms of its function, it simply excels. The Stanford study shows that it is eight times more successful of preventing injury that the traditional counterpart. 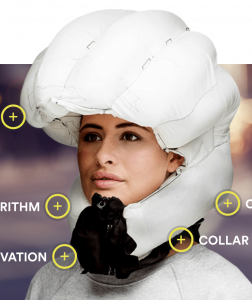 I think the bicycle helmet has the highest potential within mainstream consumer choices. I thought the second product is also useful and eliminates some problem. 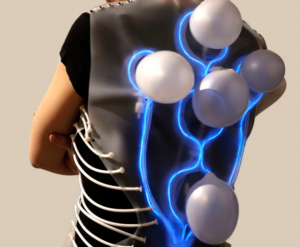 The inflatable vest idea is mobile and you could just slip it on in any office environment, where the problem of sore backs from sedentary lifestyles prevails. It is a cool and cheap alternative to a personal message or a massage chair. Assuming that the inflatable bubbles provide the same amount of relaxation, I think this vest is a cheap solution to a common problem. The last product is the one I am least thrilled about. 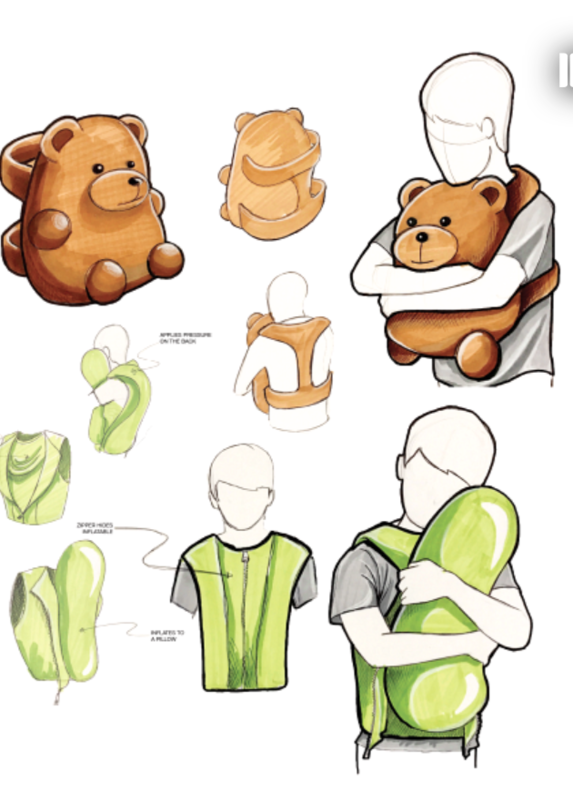 I understand that maintaining proper mental health is important and hugs provide that, but I do not think an inflatable hugging object would be an adequate alternative to hugs. It is satisfying to hug giant teddy bears when someone is young, but if an adult is seeking emotional support and hugs, she or he would want the subtle nuances that make a hug feel like a hug – the skin to skin contact, breathing motion, distinct smell, etc. I think this inflatable idea is more of a gimmick and does not address a problem. Why can someone not do the same thing to his or her pillow or blanket? This week our class discussed individual final project ideas that incorporate the concept of inflatables. I considered inflatable ideas that had artistic or activist meanings behind them. Ultimately, I decided to stick with an idea that was a practical solution to a common problem. My friends and I often go camping in California at Lake Arrowhead or Big Bear. When I pack cooking utensils in a kit or backpack, the ladle is hard to fit inside. The bottom scooping part is bulgy, awkward, and protrudes out of any bag I try to pack it in. 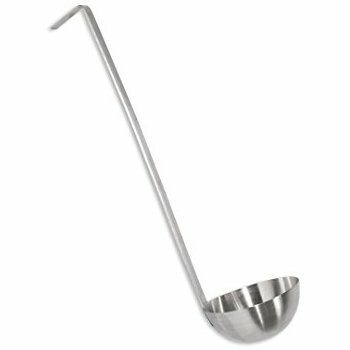 I would like to create an inflatable ladle. 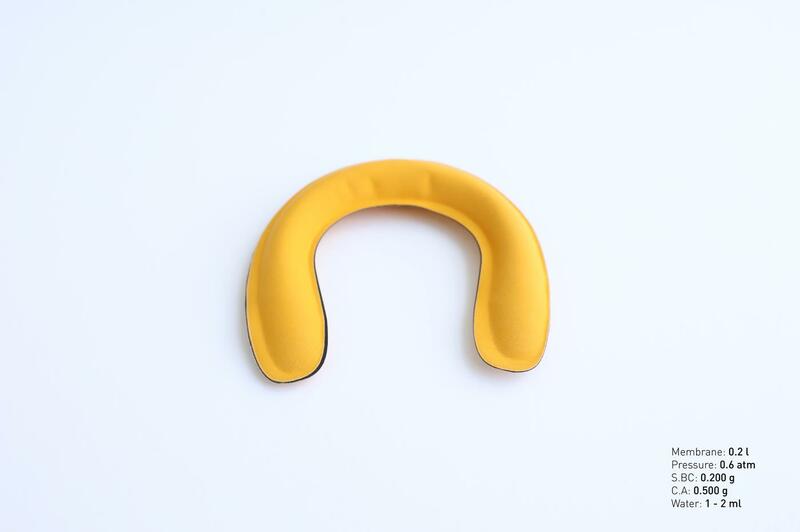 The handle and vertical part would be plastic or metal but the half-spherical portion would be an inflatable material that can be inflated by breathing into it. I think this idea would solve a simple, but annoying problem. The most challenging aspect of this idea would be the particular material chosen for the inflatable. 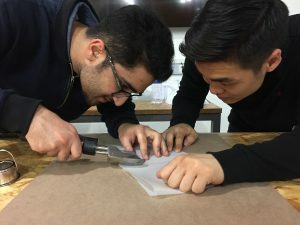 Because regular PVC and other materials cannot withstand the heat of boiling liquids (although jacuzzi water is tolerable), the professor suggested a silicone material that is heat resistant. Also, another challenge would be to create correct ridges in the material to allow a rigid, non-flaccid structure once the inflatable is pumped with air, which is ideal for scooping up liquids. I would like to present my project at the IMA show while serving some typical Korean stews/soups we cook during our camping trips. 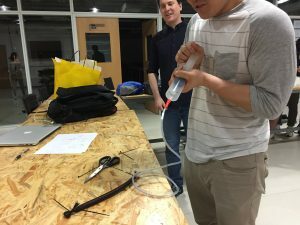 For Tuesday’s lab, my group member Isabella and I created a drastically cheaper and simpler version of the McKibben air muscle using some zip ties, balloons, manual air pumps, and a piece of netted clothing.It was interesting to learn that I could mimic the muscle movements of contraction by both inflating and deflating air into some flexible material. I did not know institutions like MIT and Cornell labs were experimenting with inflatables to create soft robotic structures. To see the first inflatable wiggle around on its own in the video before we began the lab helped me visualize what we were trying to create or emulate. We first measured the length of the balloon, which was long and skinny, and matched it accordingly with the black netted cloth, with allowing some extra length on the net to tie it with zip ties. We sealed it tight on one end and on the other side, we attached a rubber hollow tube. The rubber tubing was attached to a manual air pump. This side was also tied with zip ties but more softly to allow air to inflate the balloon. The balloon is called a pneumatic bladder in soft robotics. We then tied the “muscle” with the larger contraption created by the professor. The other three groups did the same. We then used the air pumps one by one to create a wave effect where the central frame tilted to each side smoothly. This lab furthered my understanding that inflatables can be used to mimic human muscle functions and create movement on its own. When I was a kid, I used to play in bouncing castles often because of friends’ birthday parties. They always included a slide so I wanted to include one in my sketch. Also, four circular rooftops at the edge points of the cube for aesthetic reasons. The inflatable will be PVC for its durable and smooth texture and heat sealing will be used. Because bouncing castles need the resistance to withstand the pressure from people bouncing, an electric blower will be used. Also, no more than four children will be allowed in the castle. A small doorway will be included.